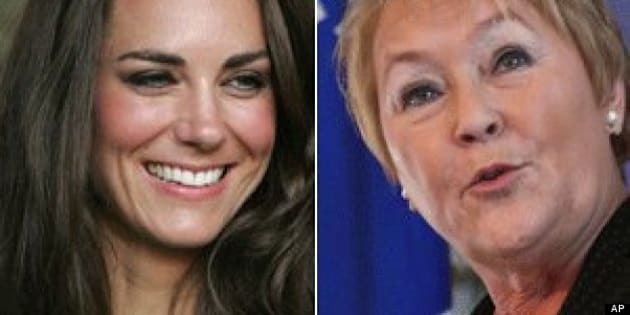 As anticipation mounts over the arrival of the first child of Prince William and his wife Catherine, the Duchess of Cambridge, the attorney general of Quebec has decided to weigh in on Canada&apos;s law to change the rules of royal succession, CBC News has learned. The law, passed by Parliament this spring, is being challenged in Quebec Superior Court by a group of legal scholars and constitutional experts. The Quebec government has decided to become an intervener in support of the challenge. The challenge is not about the law itself, which states a first-born boy or girl will be in line to the throne regardless of gender, but rather about the way the federal government went about implementing the legislation. The group believes the provinces should be involved in any constitutional amendment. Other groups who may want to intervene in the case must request permission from the court to do so. Parliament passed the bill into law with unanimous consent in March of this year, in anticipation of William and Kate&apos;s first child. A spokeswoman for Justice Minister Peter Mackay said the law is about gender equality and the ability to marry a person of another faith in the royal line of succession. "No constitutional amendment is required for Canada to give its assent to this U.K. legislation, and we are prepared to defend the Succession to the Throne Act, 2013 before Canadian courts," Paloma Aguilar told CBC News. Constitutional experts disagree as to whether the law needed consent of the provinces to go ahead. But other provinces have also warned the federal government not to take this law as a sign of things to come for future constitutional changes. As CBC reported in June, the attorney general of Manitoba, Andrew Swan, wrote in a submission, "In our view, alterations to the constitutional and legal framework of our nation require consultation with and participation by provinces and territories that is timely and meaningful." The Quebec lawyers behind the challenge and federal government lawyers are slated to meet in Quebec Superior Court August 15 to come up with a timetable on hearings for the months ahead.